Ladies Cake. 1 pound loaf sugar 3/4 " flour 6 ounces butter whites of 14 eggs - mace, citron. Cocoa nut improves it. Silver Cake Whites of 3 eggs 2 cups of flour 1 " " white sugar 1/2 " " butter 1/2 " " milk 1/2 teaspoon soda 1 " cream tartar Gold Cake Yolks of the eggs 1 cup brown sugar and make the same as silver. Raised Cake. 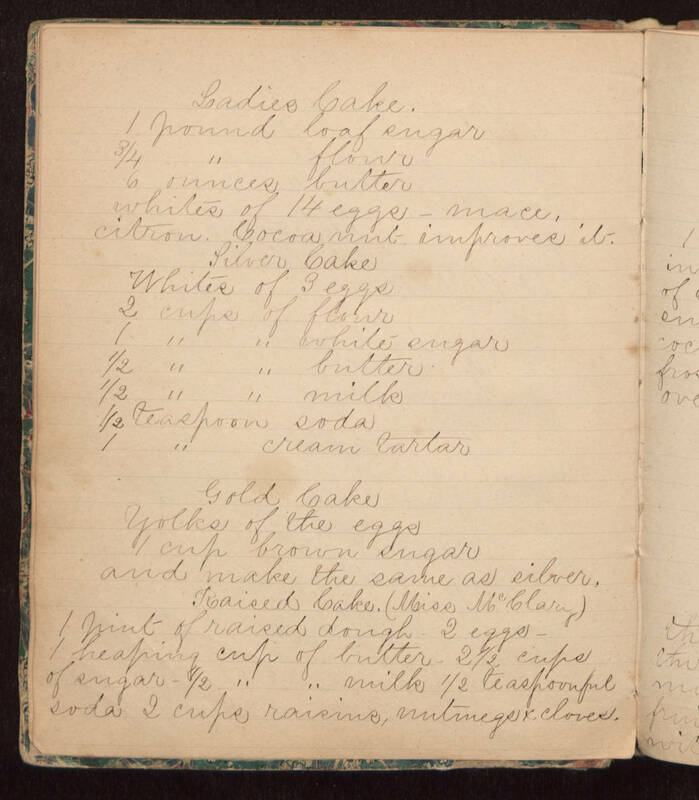 (Miss McClary) 1 pint of raised dough 2 eggs - 1 heaping cup of butter - 2 1/2 cups of sugar - 1/2 " " milk 1/2 teaspoonful soda 2 cups raisins, nutmegs & cloves.